Vibration Analyzers/Data Collectors Reliability Direct, Inc. Your Direct Source for Reliability, Maintenance, Test & Measurement! To help you prevent costly machine failures and downtime Reliability Direct Inc. offers a variety of hand held portable Vibration Meter/Analyzer/Data Collectors in both single channel and multichannel configurations from noted manufacturer's such as ADASH, IRD, Benstone and Extech Instruments. Vibration Analyzers are used to perform FFT spectrum analysis on rotating machinery usually at bearing locations. They display, store and many print the resultant spectrum analysis. Data Collectors are used to collect vibration data from multiple locations across your facility usually by preplanned route. The data is then compared to previous readings and analyzed. Multifunction Analyzers can perform both data collection and analysis. Please Visit our Knowledge Base for more Information on Vibration Analysis! accurate and reliable assessment of machine or bearing condition. 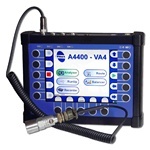 Adash A4400 VA4 Pro CMS ProBalance kit is a data collector and signal analyzer configured for all tasks of vibration diagnostics. It enables analysis of bearing condition, mechanical defects (unbalance, misalignment, resonance, looseness), lubrication, etc. apps that extend far beyond anything else in the market. MachineryMate's simple, easy- to-use meters record, analyze and display vibration signals for quick and reliable machinery health monitoring. VibeRMS LT for iPad mini has everything needed to certify and create reports for a machine based on custom thresholds in acceleration, velocity or displacement. This single-channel system is sold calibrated and ready to use out of the box. The DigivibeMX M20 is the Vibration Analyzer with the most functionality available today. It is built with an intuitive user interface and designed for the most demanding analysts. The M20 offers simple vibration analysis to complex 3D ODS simulations and more!